Fig. 555G, Fig. 555H, Fig. 556, and Fig. 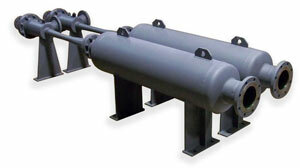 562 Single-Stage Steam Jet Ejectors are based on the ejector-venturi principle. In operation, steam issuing through an expanding nozzle has its pressure energy converted to velocity energy. A vacuum is created and the high velocity of steam entrains air or gas and the mixture of gas and steam enters the converging end of the venturi, passes through the diffuser where its velocity energy is converted into pressure sufficient to discharge against a predetermined back pressure. Single Stage Steam Jet Ejector having 4-inch 150#RF Suction and Discharge flange. Suction Connection: 4-inch 150# RF flange Discharge Connection: 4-inch 150# RFSO flange Motive Inlet: 2-inch 300# RFWN flange Material: Carbon Steel, one-piece body and tail with removable internal 304SS nozzle. Small amounts of solids or liquids will not cause operating problems. Accidental entrainment of liquid slugs can cause momentary interruption in pumping, but no damage to equipment. Used in degassing molten steel. For more detailed information about Single-Stage Steam Jet Ejectors, Bulletin 5-EH Literature. To submit a Request for Quote (RFQ) for Single-Stage Steam Jet Ejectors, Adobe PDF or submit an online interactive RFQ Form for Steam Jet Vacuum Systems.